July 18, 2011  As Scotland Yard has been swept up in the story, questions continue to be raised about Prime Minister David Cameron's decisions. 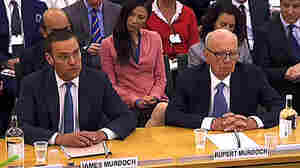 July 15, 2011  His News Corp. has handled the scandal over things done by its British tabloids "extremely well in every way possible," making just "minor mistakes," Murdoch tells one of his company's news outlets, The Wall Street Journal. 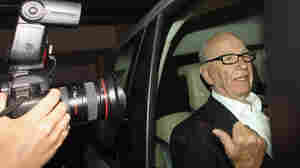 July 14, 2011  Reuters columnist David Cay Johnston says "there's no excuse" for the huge error he made Tuesday when he wrote that Rupert Murdoch's News Corp. had received billions of dollars in tax refunds, when in fact it had paid billions of dollars in taxes. July 13, 2011  As the "hacking scandal" spreads, Conservative, Labor and Liberal party leaders joined to push News International to drop its move to acquire BSkyB. They're also moving to mount a full-scale inquiry into what the media giant did. 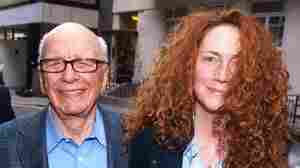 July 12, 2011  The scandal in the United Kingdom keeps expanding, and Rupert Murdoch's media holdings there have been rocked.